HOW LONG WILL MY STYLUS LAST? Cleaning of record by means of carbon fiber brush before and after every use. Cleaning of the record by using a record cleaning machine once in a while. The issue of “proper care” as outlined above is crucial in maximizing both stylus life and overall performance. A clean record is, without a doubt, the single most important part of the plan. Dust, dirt and other debris in the groove can be extremely abrasive, literally acting as sand paper to rapidly wear the stylus. And if the debris can hasten wear to the hard diamond, you can imagine what it’s doing to the soft vinyl! As Ortofon suggests, use a vacuum record cleaning machine to be sure your records are as clean as they can be. Remember to dry brush your record before and after each play. It’s important to dry brush after play to remove dust that has accumulated on the record before inserting into a clean sleeve for storage. Cleaning the stylus itself is also important. Intimate contact between the stylus and groove must be maintained and any build-up on the stylus compromises this union resulting in poor sonic reproduction, mistracking, distortion and accelerated wear. Cleaning the stylus is a two step process. First, use a dry brush to remove loose material, always remembering to use only a back-to-front motion, never side-to-side or back-to-front which can instantly ruin your cartridge. The second step employs a mild solvent applied to the stylus tip to loosen stubborn debris, followed by another light dry brushing. We’ve found the Lyra SPT to offer excellent cleaning performance, employing mild water based solvent. Mobile Fidelity also makes a good stylus cleaning formula. Set-up, including tracking force, overhang and azimuth are obvious factors that influence stylus (and record) wear. 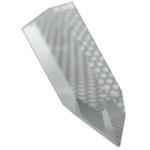 The facets of the diamond stylus are designed to fit precisely in the groove, making optimum contact with the groove walls to optimize tracking. When overhang or azimuth are set incorrectly the stylus now contacts the grooves asymmetrically causing uneven wear, possible mistracking and certainly reduced performance. 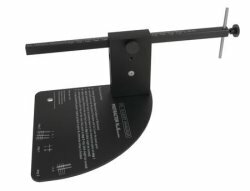 The Feickert overhang gauge (pictured) is an incredibly accurate way to set overhang. 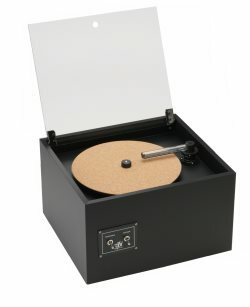 Most turntables come with at least some type of template or gauge to insure correct overhang. Lastly, tracking force; always stay within the manufacturers recommended range for tracking force. Too much tracking force causes undue wear on the stylus, vinyl and internal cartridge components. Tracking too light can cause poor tracking, which results in distortion, skipping and accelerated wear of both the stylus and record. 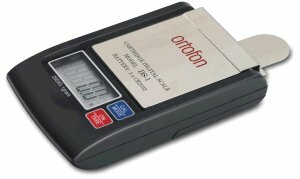 Pictured is the very accurate DS-1 digital stylus force gauge. Accurate to 1/10th of a gram, the DS-1 insures your cartridge is precisely matched to the cartridge manufacturer’s recommendation.